Does your system sometimes suffer from writer’s block? Especially when you’re trying to construct a new blog post? Then maybe it’s time you get support from these lego brick flash drives. Not because you bang them against your computer in the hope this will accomplish anything but because you lay them where they fit. The USB port! Cemented with 2 or 4GB you can marvel at how these memory stick bricks not only help to write but also make great reading blocks. And best of all, they’re not heavy to carry and can be easily transported with a keychain or strap. Whether your name is Bob or otherwise, it isn’t hard to grasp that you can build a solid data empire with these flash drive bricks at hand. And a colorful one too! That’s right, you can arrange your USB blocks with a whole variety of paints such as green, white, blue, yellow, red, black, grey or pink. Even checkered! Now if you’re concerned about safety while working with them there’s also a fix for that. Just use this flash drive helmet as a backup. 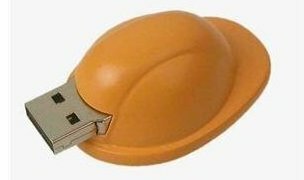 That way if any of your brick memory sticks ever break down you’re well protected with this hard hat. And besides, it makes for a nice complementary addition at your installation site. I’m sorry but I don’t know who the actual suppliers are. If you follow the amazon or ebay links you could contact the sellers and see if they can accommodate you with any logo imprinting or point you to the supplier. Is that a USB builders hat? It looks a bit more like a USB sea snail or something like that to me. I’ll stick with my USB credit card I think , these are awesome though. Yep, thats suppose to be a builders hat or hard hat. I dont see how you can see a sea snail in it, but hey – to each their imagination. nice post, i think that those are awesome, it’d be hard to lose if you stacked a bunch together. You can’t have this lying around the house or the kids will end up playing with them and forgetting where they had put it last time. Or they may play a prank on you and substitute the lego flash drive with a regular lego block. My brother used to play with lego and I think he’d like something like this. It does look a little bit toy like, so it’s not as great as some of the others and not suitable for a household with children, but still pretty cool. Love those lego USB sticks. I would like one in each colour. .-= lynne@building materials bradford´s last blog post ..PLASTERBOARD =-. These are cool and a decent price too. 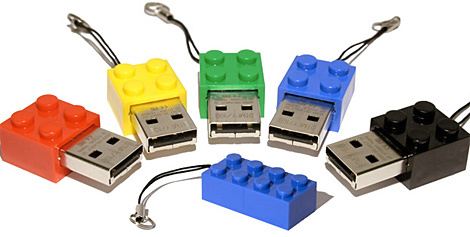 You could make some interesting lego extensions for these flash drives. Plugging in a lego house flash drives would have some interesting novelty to it. I wanna buy the black Lego flash drive. Thanks for sharing this information. Keep me updated with your new posts soon.